You are here: Home » Themes » Camp Maine. Free WordPress campground theme! Camp Maine. Free WordPress campground theme! Camp Maine. Free WordPress campground, campsite, and camping theme! 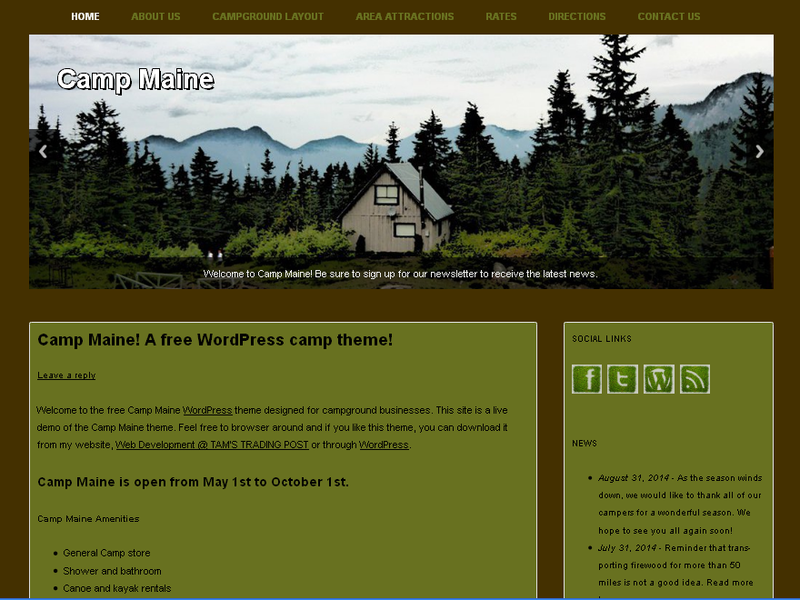 I am releasing Camp Maine which is a WordPress theme for campground businesses. Camp Maine passed WordPress’s theme development standards & testing and is hosted at their free theme directory. You can also download Camp Maine at this page. To view a demo of Camp Maine, please visit this page. I often see outdated campground websites when looking for a campground to stay in. When I do a search within a geographic area for a campground, invariably one or more search results will be a campground website that looks like it was designed in 1997. Without going into details why all businesses benefit from a well designed & up-to-date website, you can have a well designed & up-to-date campground website today! Download Camp Maine and give it a try! Camp Maine is extremely easy to setup and use. Just add a few pages, configure the footer, and optional slider images and your site is ready to go! This theme is based off of the TwentyTwelve theme and is designed for campground businesses. TwentyTwelve was used for its ability to be displayed nicely on most devices. Additional features to allow the user to add up to ten footer menu items from the customization page and header text will be visible against all backgrounds. Responsive slides was used for the image slider. Camp Maine is released under the GNU General Public License v2 or later. I am available for web development services relating to this free WordPress theme. This entry was posted in Blog, Themes on March 18, 2015 by Henry Tam.